When things such as annual festivals or public gatherings grow over the years due to the success of the original or early years, its both a blessing and a curse. On the plus side, its wonderful that a small concept can become something that’s sustainable and has organic growth and continued popularity. More offerings, great number of attractions – all good things from my perspective, especially when something grows from something very small initially. The wok. An Asian cooking utensil typically used for stir frying at high temperatures. The heat and the technique are the keys for making a great stir fry. When done well, you get a crisp, flavourful, non-greasy blend of meat, vegetables, and starch. When done poorly, the end result is an oily, slightly charred, coagulated mess of food. As simple as stir fries look to be, properly using a wok isnt that simple. 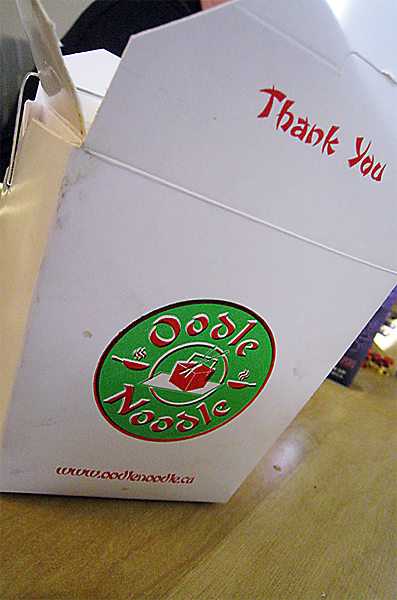 Oodle Noodle Wok Box, not to be confused with the local Edmonton chain “Wok Box”, is a small eatery that focuses primarily on wok-fried takeout. Broken down, the name actually makes a lot of sense. 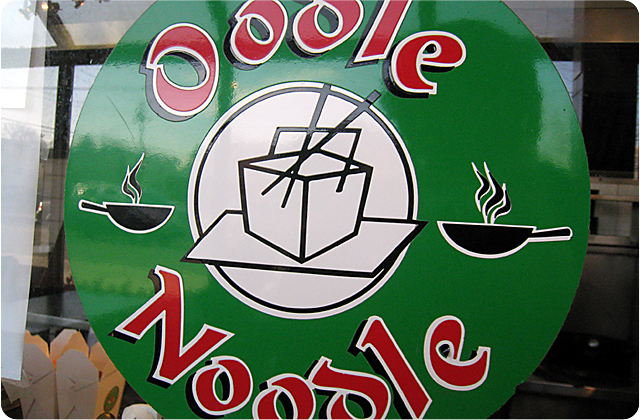 They provide a lot of noodle dishes (“oodles of noodles”), cooked in a “wok”, served in one of the classic chinese takeout containers- a “box” – first brought to the Canadian conciousness in movies and television shows set in New York. A former Mr Sub located on Whyte Avenue, Oodle Noodle Wok Box first opened shop in 2005, the first of the wok-fried stir fry locations to open up in Edmonton. Wok and Roll, Wok Box, and assorted other places opened soon afterwards. The location is nothing fancy – retaining a lot of the old fixtures from it’s previous incarnation. 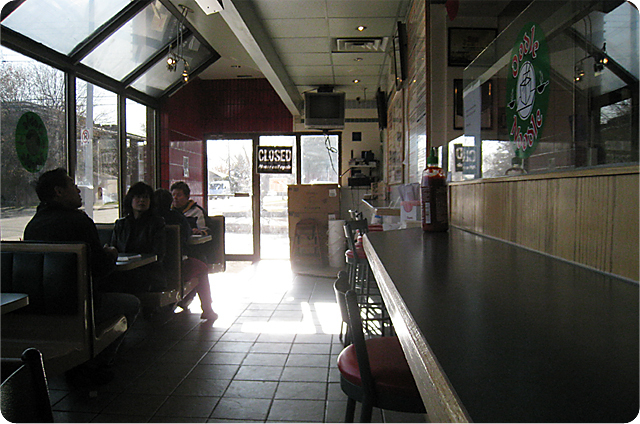 However, the counter does provide a good view of the kitchen – several employees dancing, singing, and stir frying in intense heat. Their enthusiasm is kind of catchy. The selection of foods is pretty diverse – much like a culinary tour around Asia. From Japan, Mongolia, and China, to the flavours of SE Asia (Vietnam, Singapore, Cambodia, Thailand, Malaysia) and even including India, they provide simple wok dishes of chicken, beef, and shrimp, stir fried with differnt noodles, different veggies, and different sauces. A very basic concept, but by allowing you to switch certain choices, providing you with infinite variety. The best part of the Oodle Noodle Experience? The price. $6.99 for chicken and beef. $7.99 for shrimp. They provide you with a very large serving of steaming hot food. The veggies are generally very fresh, and crisp. In general, each dish has some wonderful balance. Good acidity, spice, and sweetness. Nice texture contrasts of crisp and soft. The biggest issue is the whole dish is usually a bit oily, the result of inexperienced wok technique, and sometimes the sauce can be a bit overwhelming. Good flavour, but too much sauce leaves you with nothing but that taste in your mouth. Of all the dishes available, my favorite dish is the Jungle Curry Cambogee. I order this two times out of three. Ok, so the boxes are cute. And the dancing is catchy. And the food is pretty good. That pretty much covers it all. 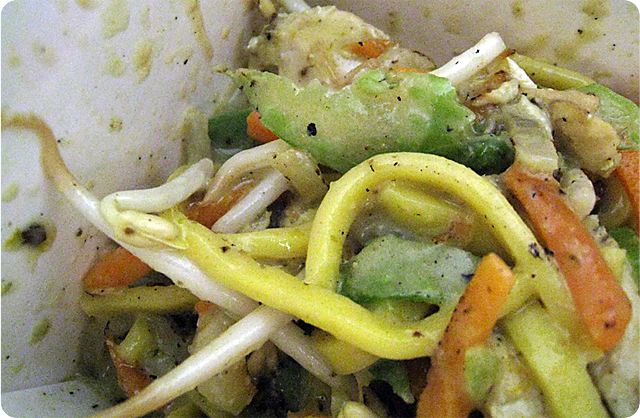 Great value – definitely the best food, and value, of all the wok places in town. And with some great opening hours (open till 10pm weekdays, 11pm Fri-Sat), they are pretty much available whenever i have a craving for some hot, filling, satisfying food at one of the best prices left in town. Kind of makes me want to dance the next time im in line – and that’s something no one needs to see! 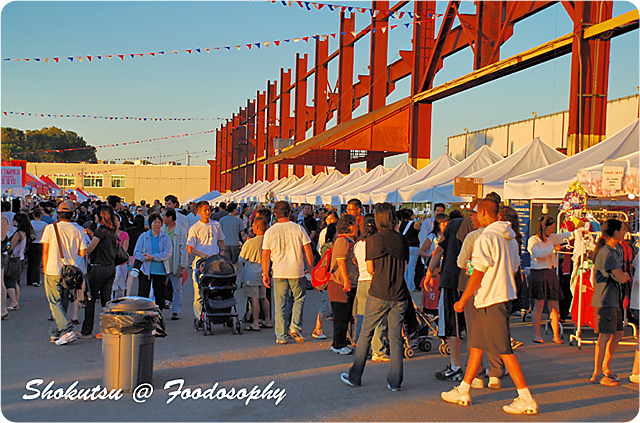 According to the organizers, the Richmond Summer Night Market features over three hundred vendors, and generates on average 14,000 visitors per night. After some early worries that it would not take place in 2008, a new group took over the reins to make sure it would happen – no doubt delighting regular visitors to this unique part of the summer nightlife in Richmond. I decided to check it out on a sudden whim, figuring a holiday Monday would bring in the crowds and give me the best sense of how successful this event really is. Getting to the general area about a half hour after its official opening, it was relatively easy to find a parking space near the grounds. As with any kind of exhibition, be it indoor or outdoor, I usually begin by walking the space, up and down the rows, checking out every corner of action before making any kind of really in-depth exploration of one particular vendor or booth. After scoping out the entire scene, I immediately realized the tents selling non-food items, well let’s just say, its not for me. Maneuvering quickly back to the food section, which basically amounted to three rows of vendors, frying, grilling, pouring, etc. 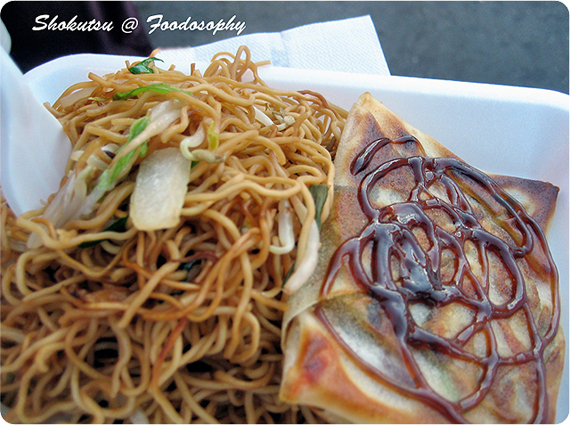 a decent variety of Asian-themed street food. Getting there on an empty stomach, I knew the strong smells coming from the places grilling meat on skewers could not be avoided, and after scanning a few (albeit neglecting what appeared to be the busiest one as I was just that hungry), I plopped down five dollars for three lamb meat-on-a-stick. 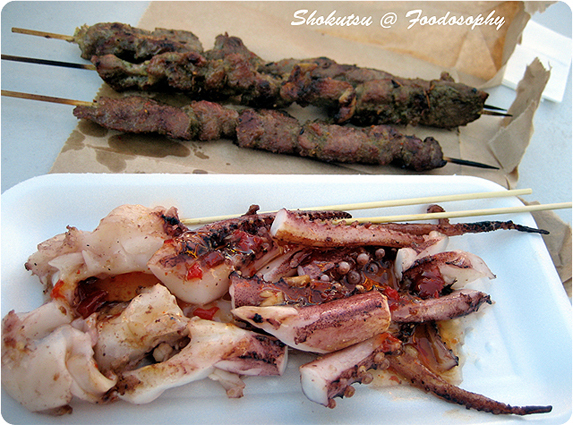 Since it was easy, I added an order of some rough chopped grilled squid as well for a couple more Loonies. The lamb skewers were too dry for my taste, and the marinade quite weak too considering the rich color. A disappointment, and knew I had made the wrong call by by-passing the more popular grill station a few booths down, that had a more interesting flavor combination like curry, and a more energetic grill master talking up the gathering crowd. The squid had a nice chewy texture, not too tough and perhaps a bit on the raw side, which probably helped it from becoming a rubbery mess. A sweet chili sauce was squirted onto the plate as it was handed to me, giving it some nice added flavor. I washed it down with a bubble tea from another nearby booth – sorry no image taken of it. Moving along, I thought being Richmond and all, that I needed to get me some Chinese offerings, as well as to continue my main goal of fueling myself. Noodles, always does the job at making you feel full, so I went to a booth that served up a combo plate selection of chow mein and I chose to pair that with what they called a duck wrap, instead of some pan-fried dumplings (with plans to make a big load of gyoza at home the next day, this was an easy call). The noodles as you would expect from a hot plate sitting there all night, were way overdone and I could get a taste of several burnt bits. The duck wrap was a pleasant surprise, although it tasted more of the thin sliced mushrooms inside than the duck, which was further masked by the sweet sauce that was drizzled on top. 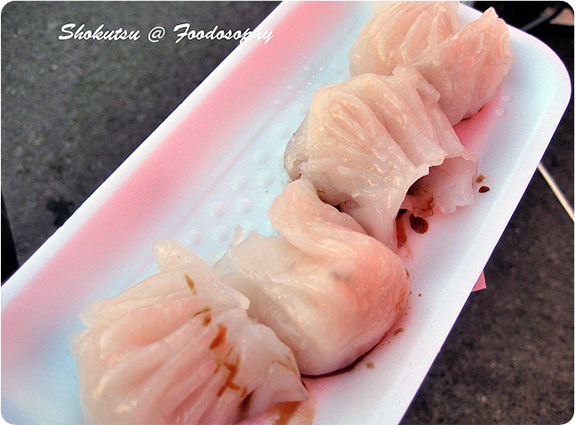 Next up or rather down the gullet, was a tray of steamed shrimp dim sum. These were a mistake, the wraps being way too thick and gummy, they were pipping hot though I will give them that. By this point, I was very, very full. Did that stop me though from picking up a dessert? Of course not. A booth called Taiwanese Snacks, was selling custard, Nutella, and red bean circular, waffle-like cakes. The lineup there was long, probably due to the fact their production line was slow. Nearby, a Korean booth was selling a similar item, though made in a mold shaped like a fish (Taiyaki, in Japanese), also for one dollar a piece. [Sorry, no images of these as I was wolfing them down in my car on the drive home]. So as you can see, a very filling dinner was had on this visit, and I left just before it started getting dark. Granted you’re not getting the best quality stuff at a gathering like this, with vendors having limited resources and facilities to prepare anything genuine, but its still a refreshing scene to take in, especially when the weather is so nice as it has been this summer in Vancouver. I believe there is a similar operation down in Chinatown too, so perhaps I will go there just for comparisions sake.